Terracotta tiles are warm and inviting, with colors that reflect an old world ambiance and fit and blend with many home decor styles. Cleaning, sealing and polishing terracotta tiles is an important stage in creating your floor, due to the porous texture of unsealed terracotta and its tendency to stain easily sealing before grouting protects the absorbant suface from grout or mortar. Once sealed, polishing also enhances the sealants to create depth and richness to the natural colors, with the option of tinted polishes and final sealants to finish. 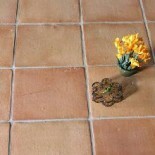 Clean all terracotta tiles thoroughly with a damp sponge or cloth, taking care to avoid stains from excessive water. Avoid using cleansers with harsh chemicals before a sealant has been applied. Clean up any grout on the tiles with a commercially available grout residue remover. Apply lightly and evenly. Treat tiles with an efflorescence remover product, if necessary. Terracotta tiles have a tendency to be coated with white powdery stains, referred to as efflorescence. If evident, remove before sealing. Allow tiles to air-dry completely. Make sure no dirt or foreign objects have settled on the tiles before applying sealants. Coat tiles evenly with several layers of boiled linseed oil if the deep, warm colors of a traditional terracotta style are desired or a clear sealer such as Mattstone or a similar primer. If this is not done before the grouting process, you will need to protect the grout lines with tape or a careful application procedure. Let dry. Apply beeswax in clear or with antique tints for your desired look. Choose a paste that requires thinning with white spirits or a pre-mixed version that is ready to apply. Use a stiff brush or rag for even application. Only apply a floor sealant recommended for terracotta tiles. Follow directions for drying time, typically 60 minutes between each layer and 24 hours after the final layer. Refrain from washing a floor for seven to 10 days. Apply a floor shine and hardener product for a glossy look. Reapply as needed, without the need to strip previous layers. Research our products such as impregnating sealers or gloss and specialty sealants. An alternate method to linseed oil and beeswax is to use a synthetic product containing both a polish and a sealant. Apply several coats for a hardened, lasting finish. Consider applying sealant before grouting, to avoid potential staining of the terracotta. Experiment with a few tiles to gauge the effect of various sealers. After the original polish and sealant, reapply wax and sealant as needed. Terracotta is easily stained, so apply sealant as soon as possible after laying the tiles. Thanks for your wonderful blog. This information is really useful. Well done. Do you need to seal the underside of the terracotta tiles or just the tops and grout lines? This entry was posted on June 20, 2013 by Living Terracotta in Terracotta sealing tips.